French supermarket chain takes over HCMC hypermarket from Hong Kong retail firm. Auchan Retail Vietnam officially re-opened and changed the name of the Giant supermarket to Auchan Crescent Mall hypermarket on November 28, following the acquisition of the Giant retail chain owned by Hong Kong retailer Dairy Farm International Holdings Ltd. 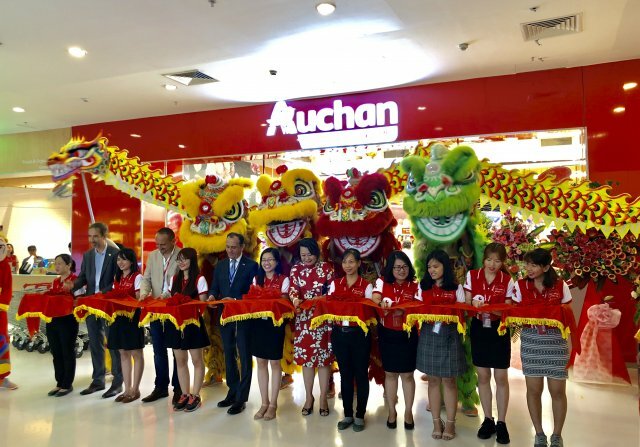 Covering an area of up to 3,500 sq m at the Crescent Mall shopping center at the Phu My Hung Urban Area in Ho Chi Minh City’s District 7, Auchan Crescent Mall becomes its first hypermarket in Vietnam and the 21st store belonging to Auchan Retail Vietnam. The hypermarket has a modern and trendy design and investment of around $860,000 in equipment and goods. It displays more than 16,000 necessities, including fresh food, cosmetics, fashion, and home appliances in a convenient shopping space. Auchan also officially launched the e-commerce website for Crescent Mall, with a home delivery service (within 15 km) and a Click & Collect service on the entire range of products. With the combination of online and onsite shopping, Auchan Crescent Mall will meet consumers’ demand in District 7 and Ho Chi Minh City, especially during the year-end shopping season. “From a solid initial foundation with a convenient location in a premium residential area and a capable staff, we believe Auchan Vietnam will definitely be able to take over this site and turn it into the largest hypermarket ever in the region, by adding our customer-oriented business philosophy of becoming a fighter for fresh food, for people’s health, and for the benefit of local people while still maintaining good pricing positioning in the market,” said Mr. Philippe Courbois from the Board of Directors at Auchan Retail Vietnam. This is also the first merger and acquisition (M&A) deal of Auchan Retail Vietnam, with the aim of bringing benefits to both Auchan Retail Vietnam and Dairy Farm and strengthening the position of Auchan in the retail market. Auchan Retail Vietnam will continue to cooperate with all partners, clients and stakeholders for sustainable growth and prosperity. Auchan Retail Vietnam in February announced its full acquisition of the Giant hypermarket at Crescent Mall in its half-yearly annual report. It has 21 stores in Vietnam, including in Ho Chi Minh City and Hanoi and southern Tay Ninh province, with more than 1,000 employees and operating under different models: hypermarket, supermarket, convenience stores, and e-commerce websites.